Coming in April From KL STUDIO CLASSICS - First Time on BLU-RAY - Vernon Sewell's THE CRIMSON CULT (aka CURSE OF THE CRIMSON ALTAR) - Starring BORIS KARLOFF, CHRISTOPHER LEE, BARBARA STEELE, MARK EDEN and MICHAEL GOUGH. COMING IN MAY - ON BLU-RAY & DVD - ROGER CORMAN'S X: THE MAN WITH X-RAY EYES - STARRING RAY MILLAND, DIANA VAN DER VLIS, HAROLD J. STONE, JOHN HOYT & DON RICKLES - BRAND NEW HD MASTER! Extras for the April releases will be announced soon as well as the May releases. Original Making-of Featurette "Dell's Lunch Counter"
Excellent idea for a thread - Kino deserves one, especially considering their considerable affection for indie horror (and this IS a horror forum). Not too keen on the stuff from the 50's and 60's but Kino does have Savage Weekend on the schedule and who knows what else. They're also supposed to have licensed MIRACLE MILE and CHERRY 2000 but nothing official has been confirmed yet. I'd love to see more Cannon library titles. Definitely looking forward to re-evaluating Savage Weekend. There has also been some speculation about Raw Meat. It'd be very nice if they had that one. I saw that on Scorpion's Facebook the other day. I'm betting it's Raw Meat, but I'd be happy with any of the three. Vice Squad would be nice too, but I don't think MGM has that one to license. I saw Lisa a few years back on NetFlix when they used to have a treasure trove of MGM titles. Didn't really care for it then, but would definitely give it another try. I much preferred the similar Fatal Charm, another MGM title from 1990 that used to be on NetFlix streaming. Out of those three, I'd prefer Raw Meat. Poltergeist III has too many awkward moments, and there is no replacing Julian Beck. If it is a choice between the two, i'd go Raw Meat as well. I don't love Raw Meat but Poltergeist III, with the loss of most of the cast and the effects all done practically rather than via ILM feels like it lives in a whole other universe than the first two. Great thread. I'm really enjoying the Kino releases thus far. The Quatermass Xperiment was one of my favorite Blu-ray releases of last year. whoa, Kino is releasing Tales of Terror? That's a surprise, I figured Shout would have snatched that when they picked up all the other Price Poe films. Oh well, it looks like a great release regardless. Can't wait to pick that up! I'm definitely interested in Tales of Terror, but may opt for Arrow's release instead. I will pass on Curse of the Crimson Altar after buying last year's UK release from Odeon. Glad to see The Premature Burial coming as well. Kino is giving us tons of releases and doing a nice job covering different genres! I've enjoyed their Charles Bronson Blu-rays so far (Breakheart Pass & Mr. Majestyk) and look forward to The White Buffalo. Drum was a great Blu-ray release too along with White Lightning and Gator. Also plan to pick up their Blaxploitation titles like Across 110th Street & Cotton Comes to Harlem. I read that the Blaxploitation zombie film Sugar Hill is coming from Kino later this year (no date announced). There's a good chance more Cannon films are coming too. 52 Pick-Up arrives next month on Blu-ray. I'm still interested in next week's release of River's Edge, even though the reviews have not been all that kind. 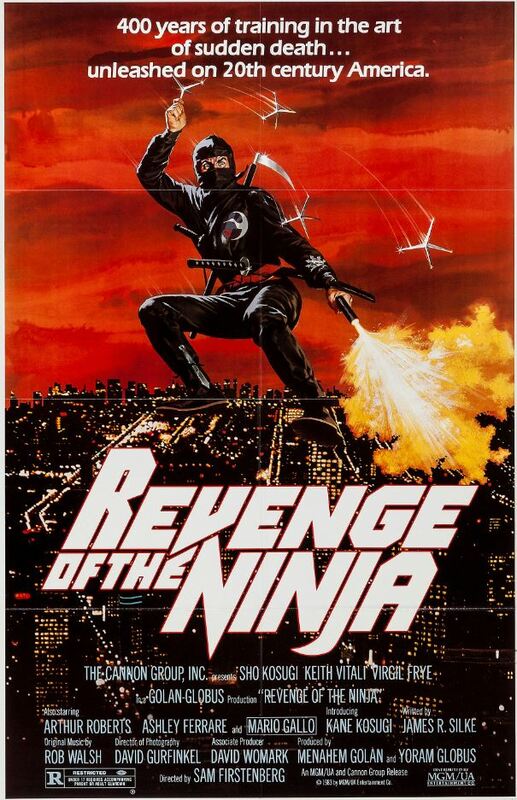 Now we just need Revenge of the Ninja, my personal favorite. Now all we need is Revenge of the Ninja and Pray For Death. Wouldn't mind Rage of Honor as well, but I don't really consider it essential Kosugi like the others. Hoping it's the uncut version. Awesome news regardless! Hope Pray For Death (uncut) is next.